This is really good--I don't add any sugar, maybe a bit of crystallized ginger. I've used dried cranberries and fresh cranberries. It is great to set up at night and wake up to a warm bowl of apple sauce. I like it on top of my oatmeal! Yes, now you can have it all: Food from your slow cooker that is scrumptious, quick and easy to prepare--and low fat! This latest volume in the best-selling Fix-It and Forget-It tradition gives you more than 500 new and revised recipes that are mouth-watering but guilt-free. Now you can choose healthy, light dishes, fix them quickly, and then forget about them until mealtime. With each recipe comes an analysis of its calories, fats, and carbs, as well as what it contributes to your daily vitamins and nutrients. Fix-It and Enjoy-It 5-Ingredient Recipes: Quick and Easy--for Stove-top and Oven! Fix-It and Enjoy-It Diabetic Cookbook: All-Purpose Recipes--To Include Everyone! 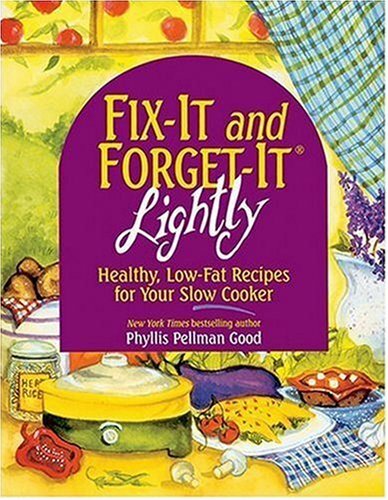 Fix-It and Forget-It Diabetic Cookbook: Slow-Cooker Favorites-To Include Everyone! Fix-It and Forget-It Slow Cooker Diabetic Cookbook: 550 Slow Cooker Favorites-to Include Everyone! Lazy Day Cookin': Slow-Cooker Meals That Simmer to Delicious Perfection While You Work, Play or Sleep!